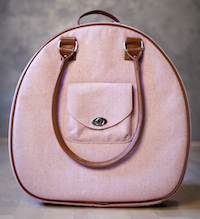 This is my first guest review on FunChiCo Laptop Bag News! I'm very excited - hopefully it will bring readers a fresh perspective! 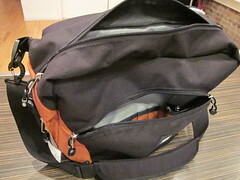 It's from my good friend, Daniel, who really puts his laptop bag to the test. I hope you enjoy it. If you'd like to write a guest review, get in touch with me! After negotiating my way past the fact the URL provided in the ad, booq.com, did not take me to the Booq site (Yo! Booq! Get it together! ), and discovering booqbags.com did, I was on my way. After much deliberation, I settled on the Mamba Sling). I paid the $125 US, plus shipping (and grievous duty courtesy Canada Customs & Excise) and had my shiny new bag in a week. I got it in basic black, but there is a choice of black, red, tan and navy. On the down side, the cover of the main pouch can be difficult to zip-up because of the way it curves over the top of the bag. It’s a procedure you definitely don’t want to try with one hand or when wearing the bag.